Remember that period during our pregnancy when our hair and skin start looking great? That time when everyone keeps fawning over how our skin glows and our hair looks so thick and shiny? And we felt so beautiful it almost seemed like a dream? Now, what is the one thing about dreams that we all hate? Yes, sooner or later we all have to wake up to reality! My reality came crashing down on me 3 months after my delivery and let me tell you, it wasn't pretty. My mum had the baby room done up in blue and white with white sheets and blue edged pillows. One morning on the start of my babys 4th month I woke up resembling an Oak tree in Autumn! Black squiggles of hair covered my white pillow cover and while shampooing my hair, I ran my fingers through it to find clumps of it coming clean off! I almost screamed out loud! Well, I did actually and my mum came running in to find me sitting on the throne bawling "I'm going bald!" Here is the simple reason as to why we must give up our glorious mane post pregnancy: HORMONES! During pregnancy our body pumps itself full of pregnancy hormones which drastically reduces hairfall and once our little person is out, our body slowly gets the hormone levels back to normal. So basically post partum hairloss is all a result of peaked hormone levels returning to normalcy. So the thick, gorgeous mane we grew will soon be shed and in copious amounts as well! But do not freak out like how I did because this is normal. In fact more than 50% of women have this so you're not alone! We get you! And not to fear! You will not go bald. 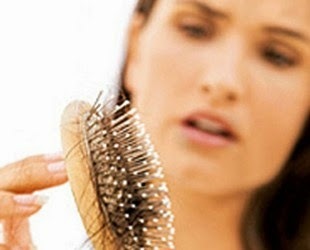 In case you feel your hairfall hasn't reduced even after a year, then you need to consult your gyneac. A lot of us love hairstyles so severe it looks like we've had a facelift done. This is a strict no no. Your hair is extremely fragile and dropping like crazy so trying out tightly bound hairstyles is kind of like adding fuel to the fire. So let your hair roots relax. Though a tight bun seems most comfortable while looking after your baby, I would suggest a really loose braid. Not only will you look really nice, you would also be giving your hair roots a teeny vacation as well! Hygiene is crucial during this time. Do shampoo and condition your hair. However, it is best to avoid shampoos with a high chemical content. Opt for milder shampoos and conditioners. Do not keep shampoo lather in your hair for long and steer clear of the roots while conditioning. Go natural and you can see a visible difference in your hairfall. Oh my god! I cannot stress the importance of oil enough! I suggest applying warm almond oil right onto the scalp every alternate day. Leave on for 15-20 minutes, massage gently and shampoo lightly. I saw a visible reduction in hairfall after I started oiling my roots. We love our long hair, yes we do; but scanty long hair? Nah! Go to a good hairdresser and get a fab haircut. Short is good post pregnancy. Not only will your hair be easier to handle, trimmimg away your split ends will really help reduce the amount of hair you lose. Heard enough fat jokes post pregnancy? Well you need to just play deaf to all the taunters and go slow with the weight loss. A lot of water weight will go off on its own and with your baby becoming more and more active you will slowly but surely get your body back. But whatever you do, PLEASE do not crash diet! One, you will be breast feeding and your baby needs all the nutrients it can get. And two, you need to sustain your health, because whatever nutrients you eat is being shared with your baby. What you can do is cut off fried, fatty and extremely sugary foods from your diet and go fresh and healthy. Do snack once in a while and start a healthy diet (definitely not crash) only after your baby has adjusted to solids. Sufficient nutrient intake is absolutely necessary for hair growth. If you do not provide your body with enough, you will not only lose your accumulated hair, you would also prevent new hair from sprouting. So load up on protein, iron and calcium rich foods. Do talk to your gyneac about taking Vit E and Vit D3 supplements. They make a world of difference. Post pregnancy period is no piece of cake. As a new mum I totally get where the stress is coming from. I have gone for days without sleep and without a moment to myself. Some days I feel so angry, irritated and stressed out that I could tear a telephone book in half. We've all been there I am sure. First off, take a deep breath, calm down and refer my very first article Whoaaa New Mama! which was written especially keeping new mums in mind. I was extremely worried initially but now I'm fine because hallelujah! I see tiny hairs sprouting. I suppose we will all get our head of hair back to normal by the time our babies are a year old :) so just hang in there and stay happy happy!